Oleg Vladimirovich Deripaska (Russian: Оле́г Влади́мирович Дерипа́ска; born January 2, 1968) is a Russian oligarch and philanthropist. He is the founder and owner of one of the largest Russian industrial groups Basic Element. He is the president of En+ Group and United Company Rusal, the second largest aluminium company in the world. Deripaska was born in Dzerzhinsk, Nizhny Novgorod Oblast, Soviet Russia to Jewish parents and grew up in Ust-Labinsk, Krasnodar Krai. His family were Kuban Cossacks. Deripaska grew up on the family's small farm, where from the age of 5 or 6, he learned how to live off the land from his grandparents, who primarily raised him after his widowed mother, an engineer, had to leave to find work. Deripaska credits his grandparents for teaching him the discipline of hard work along with farming. Both his grandfathers fought in the Second World War; one was killed in battle and buried in a mass grave in Austria, the other returned to Russia after the war ended. Deripaska's first job was at the Ust-Labinsk plant where his mother worked. At age 11, he became an electrician's apprentice doing maintenance on electrical motors. 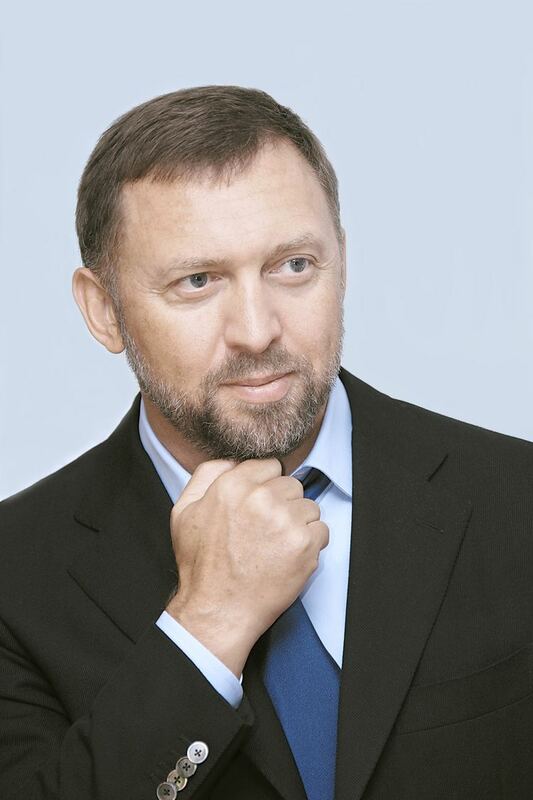 Deripaska acquired a passion for reading; his favorite authors were Mayne Reid and Jack London. Today, Basic Element's headquarters contain walls of books, reflecting Deripaska's lifelong love of reading. His talent for math allowed him to enroll at the physics faculty of Moscow State University in 1985. One year into his studies, he was conscripted into the armed forces and served in the Soviet army's Strategic Missile Forces in the Trans-Baikal area, Siberia, from 1986–1989. In 1993, Deripaska graduated with honors in physics from Moscow State University; however, the collapse of the Soviet Union greatly eliminated academic funding and made it impossible for him to continue his studies as a theoretical physicist. There were no stipends or grants for students either. "We had no money. It was an urgent and practical question every day. How do I earn money to buy food and keep studying?" he recalls. In 1996, he earned a master's degree from the Plekhanov University of Economics. At the age of 25, teaming up with fellow physicists, engineers and rocket scientists, Deripaska set up his first metal trading company, VTK. He adopted a systematic, scientific approach to commodity trading. "I represented companies that were buying and selling raw materials", Deripaska said. Deripaska undertook export arbitrage, buying metal at low Russian prices and selling it abroad at significantly higher international market prices. Deripaska traded primarily through the Baltic state of Estonia as the Russian system of export licenses was in disarray. "I started my business at an unusual moment in history. The country in which I was born raised had disappeared, although the new country was not fully formed. The first one gave me an excellent education; the second one gave me the chance of success", Deripaska recalled in an interview with Metal Bulletin. He used nearly all his arbitrage and trading profits to acquire his initial package of shares in the Sayanogorsk Aluminium Smelter, a smelter in Southern Siberia. Between 1993 and 1994, Deripaska bought vouchers and shares in Sayanogorsk, and accumulated a 20% stake in the factory, becoming the biggest individual shareholder after the Russian State — to the annoyance of the plant's Communist-era bosses. In 1994, Deripaska became director general of the plant at the age of 26. In 1997, the smelter became the core asset of Sibirsky (Siberian) Aluminium Group. 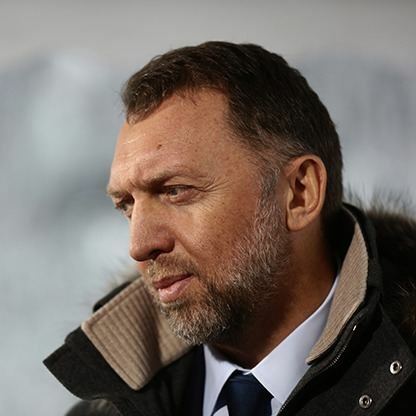 Deripaska was general manager and the main shareholder of the Sayanogorsk Smelter (1994–97) and held the post of president of Sibirsky Aluminium Investment Industrial Group (1997–2001), which later became the core asset of RUSAL. After acquisitions, mergers and changes, RUSAL went on to become the world's biggest aluminium producer in the world, until overtaken by China's Hongqiao Group in 2015. In 2010, under Deripaska's leadership, Rusal became the first Russian company to be listed on the Hong Kong Stock Exchange. Beyond metals, which remain at the core of his diversified industrial holding, Deripaska has acquired stakes in a wide range of companies in various sectors, including energy, manufacturing, commercial vehicles, auto components, financial and insurance services, leasing businesses, construction, aviation and agriculture. Among his assets are a Siberian power company EuroSibEnergo, that is Russia's biggest private energy company; Ingosstrakh, one of Russia's largest insurance companies; GAZ Group, a producer of cars, trucks and buses, agricultural business (Kuban Agro Holding); and transport companies, such as a cluster of airports in the Krasnodar region, including Sochi and Krasnodar, which hosted the 2014 Winter Olympics; and construction companies that helped build infrastructure for the Olympics in Sochi. All these assets form part of the diversified investment and industrial group Basic Element. The group was formed in 2006, with Oleg Deripaska as President and controlling shareholder. The EN+ Group is a diversified mining, metals and energy groups. It owns a majority stake in UC Rusal (48.13%) and in EuroSibEnergo. EN+ also holds interests in SMR, one of the world’s largest ferromolybdenum producers. In 2017, it reported adjusted core earnings of $2.3 billion, on revenues totaling $9.8 billion. Due to ongoing recovery in the commodity industry, EN+ Group announced plans to be listed at the London Stock Exchange in the first half of 2017. EN+ could be valued between $10 billion and $12 billion. Deripaska is the sole owner and Chairman of Supervisory Board of Basic Element, a diversified investment group established in 1997. Basic Element's assets are concentrated in five sectors: energy, manufacturing, financial services, agriculture, construction and aviation. The major assets include United Company RUSAL the world's largest aluminium and alumina producer; GAZ Group, an automotive company; Ingosstrakh, the country's oldest insurance company; Bank SOYUZ (Банк «СОЮЗ»); Aviakor aircraft manufacturer; EuroSibEnergo (ЕвроСибЭнерго), an investment and energy supply company; Glavmosstroy (Главмосстрой), a construction company; Kuban Agroholding, an agricultural company; and Basel Aero, an aviation business comprising the four largest airports in the Krasnodar territory (in joint venture with Changi Airports International). Basic Element owns companies and subsidiaries in Russia, the CIS countries, Africa, Australia, Asia, Europe and Latin America. It employs as many as 250,000 people. United Company RUSAL is the world's second largest aluminium company. It was the largest until it was overtaken by China Hongqiao Group in 2015. UC RUSAL accounts for almost 7% of the world's primary aluminium output and 7% of the world’s alumina production. UC RUSAL was formed through a series of mergers and acquisitions. 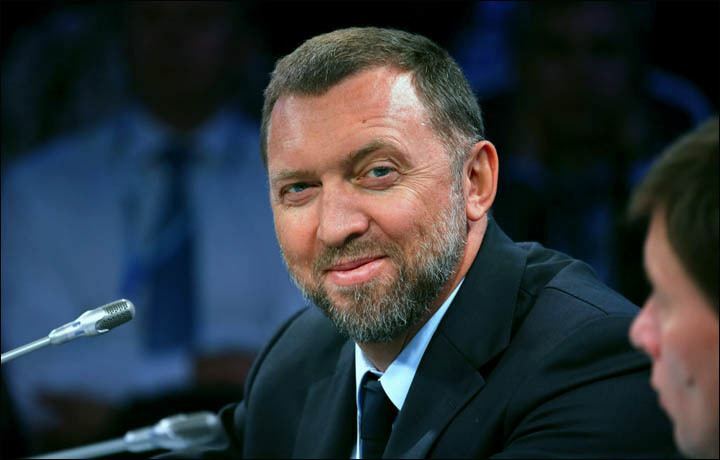 In 2000, Deripaska's Sibirsky Aluminium and Roman Abramovich's Millhouse Capital created a partnership to manage the aluminium and alumina assets they controlled, and founded RUSAL. In 2003, businesses led by Deripaska increased their stake in those companies under common management to 75% by acquiring half of the interest managed by Millhouse Capital. In 2004, the consolidation of RUSAL's ownership by companies related to Deripaska was completed with the acquisition of the remaining 25% equity interest in RUSAL managed by Millhouse Capital. In order to ensure a stable supply of alumina to its smelters, several mergers and acquisitions were accomplished by RUSAL under Deripaska’s guidance. At the beginning of the 2000s, RUSAL acquired bauxite mines in Guinea, a country with the world’s largest bauxite reserves. Subsequently, RUSAL acquired a stake in an alumina refinery in Australia. After the merger with Glencore, bauxite and alumina assets in Jamaica, Italy and Ireland were added to RUSAL's portfolio. These transactions converted RUSAL from a company with few supplies of the raw material bauxite into a vertically integrated corporation. In parallel, Deripaska invested significantly in the operational improvement of smelters inside Russia. He said, "We consolidated the industry, and located bauxites that do not exist in Russia. We established the company that became the leader of industry in less than twelve years. But to become the number one alumimium producer in the world, we had to improve our operations practice. To apply the best practices in the world, we looked at Toyota, which had utilized a precise, deep and well thought-through process for almost thirty years of operations." Deripaska himself has been an active supporter Japanese production efficiencies made popular by the "Toyota Way." RUSAL smelters have adopted the concept of kaizen, which means continuous improvement and involves training workers in standardized production techniques. "It's important to change both the company’s mind set and reporting lines," Deripaska said. "Instead of top-down management, you should understand everything is in the hands of your operator and empower that operator to drive efficiencies and improvements directly on the factory floor." Under Deripaska's leadership, RUSAL undertook large-scale modernization projects at a number of its facilities, including the Bratsk, Krasnoyarsk and Irkutsk aluminium smelters. At Deripaska's behest, in 2007, RUSAL; SUAL Group, one of the world's top 10 aluminum producers; and Glencore International AG, the Swiss natural resources group, merged their assets to form United Company RUSAL, the world's largest aluminum and alumina producer. With the onset of the financial crisis in 2008, UC Rusal was provided with a $4.5 billion loan from Russian state bank VEB to ease the company's debt burden. In the middle of the financial crisis, Deripaska returned in 2009 to RUSAL as CEO to lead the company through the debt restructuring process. "I worked 16-hour days. We were in default, although none of the parties involved wanted to call it default." As part of contingency measures, Deripaska cut costs at RUSAL by 25% in 2009. By December 2009, Deripaska reached a final agreement with over 70 Russian and international lenders to refinance US$17 billion of debt. In 2017, Rusal issued two Eurobonds to finance its debts. The first one, worth US$600 million, was issued in February, followed by the second one in April, worth US$500 million. Also in February, plans were announced to sell 10 billion yuan worth of seven-year onshore bonds to finance purchases in China. This made Rusal the first foreign company to offer panda bonds on the Shanghai Stock Exchange. The company also agreed on a pre-export finance mechanism with international lenders worth US$1.7 billion for debt refinancing. In 2013, Deripaska was awarded the "Aluminium Industry Ambassador Award" in the Metal Bulletin Awards for Excellence for his "great influence within the global aluminium industry and the wider market." As of 2017, Deripaska maintains his position as president of RUSAL, focusing on the strategic development of the company, which employs more than 61,000 people in 20 countries on five continents. Oleg Deripaska owns a 100 percent stake in EuroSibEnergo, the world's largest private hydrogeneration company and the largest private power company in Russia. It controls and manages 18 power plants with a combined installed energy capacity of 19.5 GW, including 15 GW provided by hydrogeneration. The company produces approximately 9% of all electricity in Russia and is also the leader in the Siberian energy market, with a market share totaling 41%. Some of EuroSibEnergo’s key clients include the largest aluminum plants in Russia. The company owns large fuel resources, which satisfy over 85% of the coal needs of its thermal power and boiler plants. It’s coal reserves amount to 1.26 billion tons, with annual coal production exceeding 12 million tons. Deripaska’s En + Group, of which EuroSibEnergo is a subsidiary, is investing in a joint venture with China’s largest hydroelectric power generation company China Yangtze Power Co to build new power plants in Siberia, primarily hydroelectric ones, with a total capacity of up to 10 GWt. Russian Machines corporation was established in 2005 and unites Oleg Deripaska’s machine building assets. It comprises industrial and engineering assets in the following industries: automotive OEM (GAZ Group), automotive components (RM-Systems), rail industry (RM Rail), aircraft OEM (Aviacor), road construction (RM-Terex) and agricultural machinery (AGCO-RM). Russian Machines Corporation manages 24 facilities located across 12 regions in Russia. In 2000, Deripaska started acquiring machine building assets. His first acquisition was Nizhny Novgorod-based Gorkovsky Automobile Plant (GAZ), which was previously a government-run company. In 2005, GAZ Group was established by combining the businessman’s machine building assets. The Russian automotive conglomerate, GAZ Group, comprises 18 manufacturing facilities in eight regions of Russia, as well as sales and service organizations. GAZ Group produces light and medium commercial vehicles, heavy trucks, buses, cars, road construction equipment, power units and automotive components. Oleg Deripaska’s airport business is managed by Basel Aero, a company-operator of the Sochi, Krasnodar, Gelendzhik and Anapa airports. These airports handle more than 7% of the total passenger flow in Russia. Sochi International Airport was the main gateway to Sochi Winter Olympics in 2014 and successfully serviced the guests and participants of the Games. In October 2014, Sochi was granted Open Skies status, meaning that any foreign carrier may pick up and drop off passengers and cargo with no restrictions on aircraft type, frequency, and regardless of inter-State agreements. Deripaska personally holds 10 percent of Ingosstrakh's ordinary shares. The company is a leading insurer of complex risks such as insurance of the liability of ship owners, ship hull insurance, insurance against aviation and space related risks, and insurance of transportation companies. Ingosstrakh has 83 branches in Russia and the Company’s offices operate in 220 Russian towns and cities. Oleg Deripaska fully owns Kuban Agroholding, a massive agribusiness in southern Russia. The company integrates two dairy farms, а 16,000 pig capacity breeding complex, three elevators with non-recurrent grain storage capacity of more than 270,000 tonnes, three seed plants, a sugar factory and the Sunrise horse breeding farm, specializing in the breeding of English thoroughbred horses. It is one of the top-20 largest agribusinesses and top-5 most efficient land users in Russia. Kuban Agroholding is one of the few agrocompanies in Russia involved in embryo transfer technology that allows for the reproduction of high-yielding milk cows out of less productive recipients. The company has gained significant media attention about its corn-seeding program deploying several dozen corn brands selected by its genetic specialists. In 2008, Forbes estimated his wealth at US$28 billion, making him the then ninth richest man in the world. In 2009, Deripaska's ranking fell to a ranking of No. 164, with Forbes stating: "[H]e may not withstand collapsing markets and heavy debts". However, in 2010 his estimated US$10.7 billion fortune allowed him to rise to No. 57 of the World's Billionaires list. According to Forbes magazine, he removed the heads of his two largest companies and personally negotiated with the Russian government, banks and other creditors to restructure his loan obligations. Deripaska himself in 2007 was reported to have consistently said that the estimate of his wealth was exaggerated, that it did not completely account for the amount of debt he incurred, and that he should be ranked far below the top ten on the list of the Russian billionaires. Forbes estimated his fortune at US$3.3 billion in 2015 and $5.2 billion in 2017. In 2004, Deripaska was appointed by the President of Russia to represent the country in the Asia-Pacific Economic Cooperation Business Advisory Council (ABAC). He has been Chairman of ABAC Russia since 2007. Deripaska is the vice president of the Russian Union of Industrialists and Entrepreneurs, chairman of the executive board of the Russian national committee of the International Chamber of Commerce and a member of the Competitiveness and Entrepreneurship Council, an agency of the Russian government. He sits on the board of trustees of the Bolshoi Theatre, the School of Business Administration, the School of Public Administration, and the School of Economics at Moscow State University as well as the School of Business Administration at St. Petersburg State University. Deripaska is a co-founder of the National Science Support Foundation and the National Medicine Fund. In 1999, he was awarded the Order of Friendship, a state award of the Russian Federation. He was named businessman of the year in 1999, 2006 & 2007 by Vedomosti, a leading business daily published in partnership with The Wall Street Journal and The Financial Times. Deripaska is one of the 16 global business leaders who drafted CEO Climate Policy Recommendations to G8 Leaders, a document outlining the international business community's proposals to tackle global warming. The proposals were signed by more than 100 of the world's leading corporations and handed to the Prime Minister of Japan, Yasuo Fukuda on 20 June 2008. G8 leaders discussed the recommendations during the summit in Japan on 7–9 July 2008. The process was coordinated by the World Economic Forum in collaboration with the World Business Council for Sustainable Development. Deripaska actively advocates cutting the global carbon footprint and calls for the creation of an enforcement mechanism with consequences for countries that don't reduce carbon-intensive emissions, such as those produced by coal-fired power plants. He also remains a strong advocate of a legally binding climate change deal, but has publicly voiced concern about the potential competitive impact of a Paris climate agreement and also about the absence of binding measures to curb each country's emissions in the near future. "Everyone is in favour; we just need to have more or less fair regulation. There shouldn't be any pockets where people can cheat the system. People shouldn't agree on something that creates another Kyoto protocol that creates nice polished statements," he told the Financial Times in January 2016. He has been a permanent participant at World Economic Forum sessions since 2007, when RUSAL became WEF's strategic partner. In May 2007, Magna International chairman Frank Stronach announced that Deripaska was becoming a strategic partner in Magna. Deripaska's group built several Olympic facilities for 2014 Winter Olympics in Sochi, including the Coastal Olympic Village, Imeretisnkiy sea port, Doubler of Kurortny Avenue in Sochi, renovation of the Sochi International Airport. The total investments account for over $1.4 billion. Deripaska is also a member of the International Council at Harvard University's Belfer Center for Science and International Affairs. Deripaska personally initiated construction of the Centre for Epidemic and Microbiological Research and Treatment in the Guinean Kindia province. The Centre was designed and constructed by RUSAL specialists with the assistance of Rospotrebnadzor scientists (RUSAL has invested $10m). In 1998, Deripaska established Volnoe Delo, Russia's largest private charitable foundation. The fund supports over 400 initiatives across Russia aimed at developing education and science, preserving spiritual and cultural heritage, and improving standards in public health. It helps children, old people, talented youths, teachers, eminent scientists and other participants of the programs. Since 1998, Oleg Deripaska has invested more than 10,6 billion rubles in more than 500 charity programs in 50 regions of Russia. Volnoe Delo has supported research activities in the 2,550-year-old city of Phanagoria since 2004. More than $10 million has been allocated to Phanagoria fieldwork over the past decade. Today, Phanagoria is one of the best-equipped archeological expeditions in Russia and has its own scientific and cultural center, cutting edge equipment and technology for above-ground and underwater excavation as well as a large team of specialists involved in the excavation process. In February 2014, Deripaska financed the construction of makeshift kennels to house stray dogs that had been abandoned by construction workers after completing work on the Sochi Olympic Village. Officials said the number of strays exceeded 2,000 and the animals presented a risk of rabies, so they contracted out their extermination. Many of these dogs were saved and more were re-homed in a global adoption program that Deripaska created. That same year, Volnoe Delo foundation launched a programme on students' early career guidance and professional training—JuniorSkills. The first, pilot, championship on professional skills, JuniorSkills Hi-Tech, was held in the Urals city of Yekaterinburg in 2014, part of the nationwide championship on cross-industry blue-collar professions in high-tech WorldSkills. Deripaska supports Russia's Bolshoi Theatre and has financed such ballet performances as Flames of Paris, La Sylphide, Paquita and operas The Legend of the Invisible City of Kitezh Carmen, and Wozzeck. Michael Cherney brought legal action against Deripaska in the Commercial Court of the High Court in London. Cherney sought a declaration that he was the beneficial owner of 20% of RUSAL stock which, he claimed, Deripaska held in trust for him. The claim was denied. On 3 May 2007, Mr Justice Langley ruled that Deripaska had not been properly served, and that the court had no jurisdiction to try the claim as Deripaska did not live in England or Wales. On 3 July 2008, Mr Justice Christopher Clarke ruled that the case should be tried in England, although "the natural forum for this litigation is Russia", because, he held, "risks inherent in a trial in Russia ... are sufficient to make England the forum in which the case can most suitably be tried in the interest of both parties and the ends of justice". On 22 July 2008, he granted Deripaska leave to appeal. The Court of Appeal of England and Wales refused the appeal on 31 July 2009. At a June 2011 case management conference, the judge deferred a decision on whether Cherney would be allowed to give evidence by video link from Israel rather than appear in person. An outstanding arrest warrant issued by Interpol meant that the British would detain him if he travelled to the UK. In late July 2011, the High Court ruled to allow Cherney to give evidence at the trial by video link from Israel, and also set trial for April 2012. Deripaska denied that Cherney was owed any stake in RUSAL, and asserted payments made to Cherney had been for unavoidable "protection" at a time when violence was sweeping the region and posed an existential threat to any profitable business in the country. In an interview with The Telegraph, Deripaska said he was one of the few who worked to clean up Russian industry and provided support to law enforcement agencies. However, in this early chaotic period paying protection money to criminal gangs was inescapable, as revealed in court testimony. In September 2012, Cherney terminated his UK lawsuit against Deripaska. In 2015, Deripaska filed a lawsuit against Morgan Stanley, accusing the bank of using insider information to short sell the businessman’s $1.5 billion investment in shares of Magma in 2008. In 2007, Deripaska's Veleron investment vehicle acquired stock in Magna International through a $1.2 billion loan from BNP Paribas, with Magna shares serving as collateral. Morgan Stanley was involved in the deal through a swap agreement with BNP Paribas where the US bank assumed the risks of the loan in return for a fixed payment from Paribas. In September 2008, Magna's stocks plummeted, hit by the global economic downturn. BNP issued a $93 million margin call to Veleron. Morgan Stanley in turn learned that Veleron was unlikely to meet the call and sold the stock short. Deripaska claimed that Morgan Stanley abused its duties and engaged in unlawful insider trading that resulted in significant financial damage to Veleron, estimated at $15 million to $25 million. A New York jury determined in November 2015 that Morgan Stanley had "acquired inside information and traded on it despite a duty to keep it confidential and not trade on it," finding as well that Morgan Stanley did not have the intent to defraud Veleron. Veleron strongly disagreed with and said it would file an appeal. In July 2006, whilst Deripaska was involved in a bid to buy the Daimler Chrysler Group, it was reported that the United States canceled his entry visa; the unnamed official declined to give a reason for the revoking of the visa. The Wall Street Journal reported that it could have been because Deripaska has been accused of having links to organized crime in Russia and cited as their sources two unnamed U.S. law enforcement officials. Deripaska had received a multiple-entry visa in 2005; a U.S. Federal Bureau of Investigation spokesman refused to comment. Lobbying on his behalf had been done by former Senate Republican leader and 1996 presidential candidate Bob Dole and his Alston & Bird law partners, Senate records show. Alston & Bird was paid about US$260,000 in 2005 for work on "Department of State visa policies and procedures" tied to Deripaska. In 2009, Deripaska was again allowed entry and visited the United States twice. The Wall Street Journal reported that according to two unnamed FBI administration officials, Deripaska had met with agents regarding a continuing criminal probe, the details of the probe were not known or reported. During Deripaska's visits, he met with leading management figures from investment banks Goldman Sachs and Morgan Stanley. The Aluminum company that Deripaska heads, United Company RUSAL, was in preparations for an initial public offering. The easing of Deripaska's visa issues which were an issue for possible investors helped to reassure bankers. The State Department has never said why it revoked his visa and refused to comment on his 2009 visits. The visits were arranged outside of the usual process as the U.S. continues to have concerns about Deripaska's business associations. Deripaska has repeatedly denied a connection to any organized crime and said business rivals have caused the visa to be revoked by smearing him. When interviewed by the BBC in July 2009, Deripaska said that the authorities in the United States had been attempting to blackmail him by revoking his visa and thus affecting possible investors in a negative way and thereby hoping to push Deripaska into cooperating with them. According to an article in El Mundo, Deripaska and Iskander Makhmudov (head of UGMK) were asked by Spanish police to answer questions in relation to a money-laundering enquiry. The Spanish state prosecutor's office subsequently confirmed Deripaska's interrogation. While Deripaska has been interrogated previously as a witness in Spain and England and by the FBI in cases of money laundering, he has never been charged with any crimes in those probes. On 25 January 2010, the Financial Times published a story "Rusal: A lingering heat" exploring Deripaska's business relations with Sergei Popov and Anton Malevsky, alleged heads of Russian organized crime groups. Deripaska has accused Michael Chernoy of using Malevsky and the Izmailovskaya syndicate to extort US$250 million from him as part of a protection racket. However, Deripaska has himself been accused of having similar links to Malevsky, who, with his brother Andrei, owned a 10% stake in Deripaska's company. Deripaska denies the claims. In November 2011, Spain's High Court sent the criminal cases against Deripaska to the Russian General Prosecutor's office because the root of the cases is Russian. Deripaska is noted for his close ties with Russian President Vladimir Putin. Their relationship was visibly strained amidst Deripaska's financial struggles in 2009, however; in a widely broadcast incident on Russian television, Putin visited a stalled cement factory owned by Deripaska and berated its management. He forced Deripaska to sign a contract promising to pay nearly $1 million in unpaid wages before snapping at him, "Give me back my pen." Their relationship recovered, however, and Deripaska has been described as "Putin's favorite industrialist." Leaked U.S. diplomatic cables from 2006 described Deripaska as "among the 2-3 oligarchs Putin turns to on a regular basis" and "a more-or-less permanent fixture on Putin's trips abroad." In an interview with The Globe and Mail, Tye Burt, who knows Deripaska and is the CEO of Kinross Gold said that, "I believe Russia recognizes Oleg's major role in building a renewed economic base in a broad range of domestic businesses and rejuvenating ailing companies and infrastructure." Deripaska is a friend of Nathaniel Rothschild, a major investor in both Glencore and United Company RUSAL. Together Deripaska and Rothschild hosted George Osborne and Peter Mandelson on Deripaska's yacht in Corfu in the summer of 2008. Osborne was then Shadow Chancellor of the Exchequer of the United Kingdom and a friend of Rothschild from school and university. There was considerable controversy over the relationship between Mandelson and Deripaska after it emerged that Mandelson had spent time on Deripaska's yacht. I am very surprised by the allegations in the British press about Peter Mandelson, Oleg Deripaska and aluminium. The claims hint at Mandelson's personal intervention, in his capacity of European commissioner for trade, in favour of the Russian aluminium company Rusal. I would like to clarify that no such intervention took place. One allegation relates to a nine-year debate in the EU over tariffs on raw aluminium. The other relates to anti-dumping duties on Russian aluminium. In both instances, decisions were made after the usual consultation procedures. While Deripaska has been observer of world events and policy, he has previously stated that he has no desire to be involved in politics: "I have a strong stay away from politics as a matter of business ethics", he said. On 22 March 2017, the Associated Press published a report alleging that Paul Manafort, Donald Trump's former presidential campaign manager, negotiated a $10 million annual contract with Deripaska to promote Russian interests in politics, business, and media coverage in Europe and the United States, starting in 2005. Both Deripaska and Manafort have confirmed to have worked together in the past, but rejected the contents of the AP story. Manafort argued that his work had been inaccurately presented, and that there was nothing “inappropriate or nefarious" about it. Responding to the allegations, on March 28, 2017, Deripaska published open letters in the print editions of The Washington Post and The Wall Street Journal, in which he denied having signed a $10 million contract with Manafort in order to benefit the Putin government. He also stated his willingness to testify before the United States Congress to dispel these allegations, and argued that the accusations fall "into the negative context of current US-Russian relations." According to Congressional sources cited by The New York Times, lawmakers declined Deripaska's request, after it emerged that he had asked for immunity. Unnamed officials argued that “immunity agreements create complications for federal criminal investigators." On May 15, 2017, Deripaska filed a defamation and libel lawsuit against the Associated Press in a U.S. District Court in D.C., arguing that the outlet's report falsely claimed that Deripaska had signed a contract with Manafort to advance the goals of the Russian government. The suit also states the report wrongfully alleges a connection to the Trump electoral campaign or the presidential elections, despite Deripaska having concluded all dealings with Manafort in 2009. During the 2016 Presidential campaign, Manafort, via Kiev-based operative Konstantin Kilimnik, offered to provide briefings on political developments to Deripaska, though there is no evidence that the briefings took place. In February 2001, Deripaska married Polina Yumasheva, who is the daughter of Boris Yeltsin's top adviser Valentin Yumashev and stepdaughter of Yeltsin's daughter Tatyana. While Yeltsin was president, Deripaska's close ties put him in Yeltsin's inner circle, dubbed "The Family." The Deripaskas have two children: a son, Pyotr (born 2001), and daughter, Maria (born 2003). Deripaska practices yoga, swimming, horseback riding and hiking. His favorite pets are dogs. At his home near Moscow, he has seven horses and six dogs.